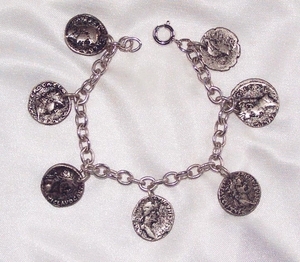 BRACELET - TEXTUREED SILVERTONE BRACELET WITH 7 ANTIQUE-LOOK CHARMS THAT LOOK LIKE OLD COINS. VERY PRETTY! FROM A LOT OF SARAH COVENTRY ITEMS - THE BRACELET MAY BE SARAH COVENTRY BUT THE CHARMS ARE PROBABLY NOT. BUT DEFINITELY OLD - THE JEWELRY FROM THIS ESTATE HAD BEEN STORED FOR OVER 30 YEARS. BRACELET IS 7 1/2" LONG. THE CHARMS/COINS ARE ABOUT 11/16" - 3/4" ALTHOUGH THEY VARY SLIGHTLY IN SIZE.